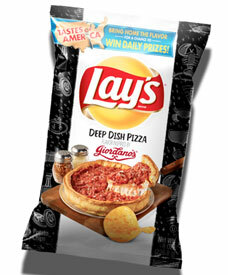 As a former Chicagoan who, sadly, never quite got fat enough to "pull a Farley" ifyouknowwhati'msayin', I must admit I was rollicked with excitement when I heard about these Giordano's deep dish-inspired Lay's®. My three favorite things (eating pizza, eating potato chips, and overeating) all in one bag! I was going to be like the Horse With The Magic Feed Bag from that one County Fair pantomime. Actually finding these outside of Chicago proved almost as tough as not finding a Dennis Farina lookalike during The World Series Of Dennis (formerly Farinacon, until Farina Mills® successfully sued for rights to the name, which now brands their traveling hot wheat cereal expo in virtually every major U.S. city). Once they were in my grubby little hands, though, they were soon in my grubby little mouth, ho. The initial experience is kinda just a ketchupy flavor, but gradually with subsequent fistsful, i started to get the crust and cheese notes coming through. I wouldn't necessarily say it all amounts to a strong pizza flavor per se, but maybe that's because I was raised on pizza-flavored Goldfish, which were irrationally heavy on the fake pizza flavor. Incidentally, wasn't pizza a more or less common chip flavor at some point? It seems like Lay's could/should have one on the shelves as an everyday staple; though as much as I wanted to LOVE their Deep Dish Pizza flavor, it's just not strong enough to fully satisfy. If I were the head of their test kitchen, I'd have pushed it more toward a deep dish sausage flavor to really make it distinctive and emblematic of what they were actually trying to do. But no, I can't work in their test kitchen, because I'm a "skin job."